There’s no better summertime indulgence than a buttery lobster roll–just the mention of one brings to mind visions of rolling waves and the scent of salty air. Even if you’re nowhere near the ocean, this recipe will make you feel like you’re living the high life on the coast of Ma ine. Over medium heat, melt butter in a large, lidded saucepan. Slowly whisk in wine, then add garlic, rosemary, sage, salt and pepper. Bring liquid to a simmer and add lobster tails. Cover pot, reduce heat, and poach until cooked through – about 8- 10 mins. Once cooked, remove lobster tails to a platter and allow to cool. Raise heat to high and boil poaching liquid until reduced by 75%- about 10 mins. Remove garlic, rosemary, sage, peppercorns. Set aside. Place a skillet, preferably cast iron, over medium heat. Split the buns and generously brush insides with reduced poaching liquid. Toast cut side down until golden. Remove lobster tails from shells and roughly chop into bite-sized pieces. Toss with creme fraiche and remaining reduction liquid. Taste for seasoning. 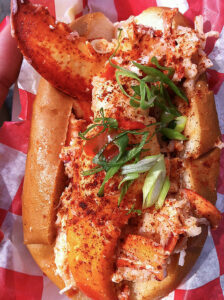 Pile lobster salad evenly between rolls and sprinkle tops with scallions.